Behind every number, there’s a story. 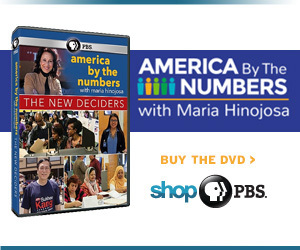 AMERICA BY THE NUMBERS WITH MARIA HINOJOSA is the first PBS documentary series to focus on the dramatic demographic shifts currently taking place in this country. As we explore underreported stories from every corner of the nation, we reveal the human face of the biggest population change in U.S. history. The new American mainstream—the growing number of Asians, Latinos, African Americans, mixed race, immigrants, women, youth, and LGBT—is influencing elections, culture, commerce, and every facet of contemporary life. We investigate these dynamic developments using infographics, statistical analysis, in-depth reporting, and compelling storytelling with anchor and executive producer Maria Hinojosa . "The New Deciders," a hour-long AMERICA BY THE NUMBERS special, premieres on September 6, 2016 at 10/9C (check local listings). Learn how Asian American, Black Millennial, Arab American and Latino Evangelical voters are exerting their growing strength and influence in this election season. AMERICA BY THE NUMBERS originally premiered on October 2, 2014 on WORLD Channel and October 4, 2014 on PBS. The series is re-airing on many PBS stations beginning July 26, 2016 with updated demographic and trend data in addition to the original documentary content.